Where do you go to find opportunities for learning? That was the big question Dani Kennisand I had almost a year ago. We were at the start of our journey as connected educators, having attended a few local edcamps and conferences. We were on Twitter, starting to participate in online chats, and eager to bring back learning and innovative ideas to our classrooms. We spent hours sharing what we found, researching conferences, and making a long list of all of the learning opportunities available to us. We started locally, with conferences we wanted to and likely could attend, but the list quickly grew to include some larger and regional events. The Google Sheet with this data grew and grew, and we shared it with a few friends, giving us our seemingly perfect guide to taking control of our own learning. With it, our dreams, aspirations, and potential for where we wanted to go and who we wanted to be as educators and professionals grew, too. This is the question that first led to the creation of The Education Calendar (#TheEduCal). We wanted a place to find, share, and promote great learning opportunities. We wanted to be able to build community and learn together. I’ve always told my students that all of us are smarter than one of us, and we wanted to make this a reality for our professional worlds through collaboration and crowdsourcing. After all, we don’t know every great event or conference in the world--but together we might. If you’re reading this, you may already be familiar with #TheEduCal, the project that grew from this collaboration and idea. You might have seen my Tweets, have found an event on the site, or even added one yourself. If not, I hope you will check it out. It started as a crowdsourced calendar of #edtech events in our region but quickly evolved to something bigger. 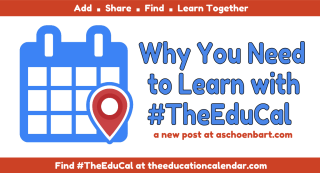 In November 2015, #TheEduCal launched as a crowdsourced map and calendar of education events worldwide. Anyone can submit an event, and it will be added to the searchable map, listed on the calendar, and promoted on Twitter for all to find and learn from. We think #TheEduCal fills a gap in the world of connected educators. There are fantastic sites that list Twitter Chats (see The Education Chat Calendarand Participate Learning), online tools, and more, but there’s an incredible power to then building on these connections in person. It’s how Dani and I have made our friends, grown PLNS, and made important professional connections with educators and and advocates from all over. This week, we were honored to be featured on the Teacher2Teacher site, in an article titled “All of Us Are Smarter Than One of Us.” We were so happy to talk with them, to share our work, and to be featured for their audience. Teacher2Teacher supports and shares important, powerful, and positive stories from educators, and this article is definitely one of the highlights of our calendar journey. Earlier this week, I explained that with #GeniusHour, I wanted my students to learn, do, and create something awesome. Reflecting now, I realize that this is our something awesome. We have big plans to continue pushing forward. As I write this, there are 145 upcoming events on #TheEduCal. Over 150 total events have been added in 2016 alone, in over 30 states, plus online and international events. Soon we plan to launch a blog, featuring promos for upcoming events and reflections from our users and Calendar Ambassadors. We want to continue to reach out across the country and world and to build or database and audience. And with your help, we can do more, learn more, and do it better. Join #TheEduCal revolution and help us find, curate, and share great learning opportunities for educators everywhere. Find The Education Calendar at theeducationcalendar.com.